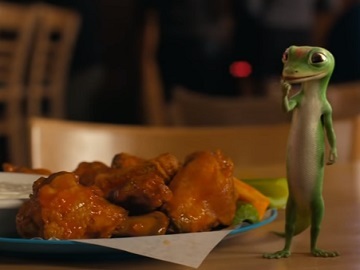 The Gecko underestimates the heat on some buffalo wings while discussing the benefits of switching to GEICO in the latest ad for the insurance company. The 30-second spot features the mascot saying he’s at a wing joint telling people that GEICO has been offering savings for over 75 years. “That’s longer than the Buffalo wing’s been around,” he mentions. At this point, a plate with a dozen wings is placed near him, on the table, which makes him put a finger on the sauce they’re covered in. His plan to add something about what the insurance company offers is then hampered by a cough and a burning sensation. He manages to say that GEICO also offers motorcycle insurance, but really hard, revealing that his lips are burning. The commercial ends with the voiceover saying “GEICO. Over 75 years of service and service” and urging viewers to see how much they could save with GEICO by visiting the company’s website. GEICO’s reptilian mascot, an anthropomorphic Day Gecko created by The Martin Agency and modified in 2005 to a CGI character by Animation Director David Hulin and his team at Framestore, first appeared in 2000, during the Screen Actors Guild strike that prevented the use of live actors and became the company’s longest-running mascot, appearing in more than 150 commercials. He has been voiced, over the years, by multiple actors, including Kelsey Grammer, Dave Kelly, and Jake Wood.